Libertia is a genus of about 12 species, two of which occur in Australia. 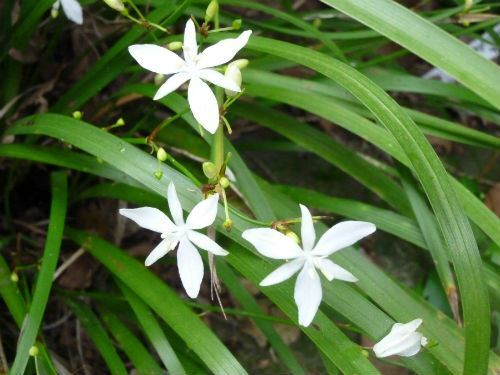 Libertia paniculata is widespread in rainforest and wet open forest on coast and adjacent ranges from south-east Queensland to eastern Victoria. The other Australian species is Libertia pulchella. They are both perennial herbs with grass-like leaves arising from an underground rhizome. 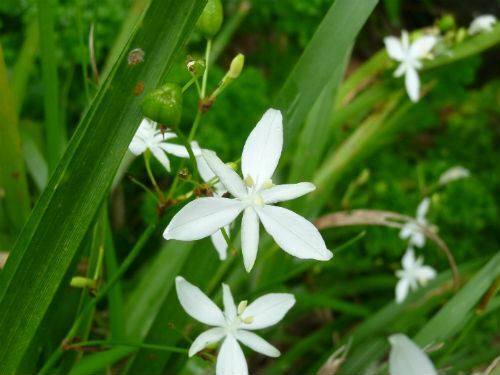 I always have a few Libertia paniculata growing in my garden as they are a great small plant, with grass like leaves, growing to about 50cms long and bearing delicate white flowers on slender stems in spring. Propagation is relatively easy from seed, which does not require any special pre-treatment, but may be slow to germinate. Maintenance: After flowering, I cut the foliage back hard, this encourages fresh new growth and also removes any old flowering stems and seed heads which can make the plant look a bit ‘scrappy’ if left on the plant. Libertia; named after Anne-Marie Libert, (1782 to 1865) a Belgian botanist and self-taught mycologist who studied mosses, lichens and their unassuming relatives. paniculata; From Latin panicula, a tuft or panicle and the suffix atus, possessing, referring to the much-branched flowering stems of the species.